The University of Bridgeport today announced that Drs. 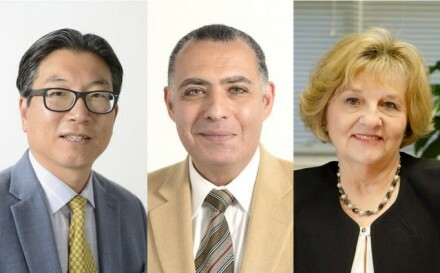 Manyul Im, Carol Papp, and Tarek Sobh have been named Deans of the University’s three newly created colleges: The College of Arts and Sciences; The College of Engineering, Business and Education; and The College of Health Sciences. The three entities now collectively house all of UB’s colleges and schools. All programs continue to be offered, and the colleges are intended to give faculty members broader interaction with their peers and to be venues for furthering the primary strategic goals of the University. Dr. Manyul Im will serve as Dean of the College of Arts and Sciences. The new college will include the following divisions: SASD (Shintaro Akatsu School of Design), School of Professional Studies, and programs formerly offered at the College of Public and International Affairs and the School of Arts and Sciences. The College of Health Sciences will be led by Dean Dr. Carol Papp. The new college includes Fones School of Dental Hygiene, School of Nursing, College of Chiropractic, Physician Assistant Institute, Nutrition Institute, College of Naturopathic Medicine, and the Acupuncture Institute. The School of Engineering, Ernest C. Trefz School of Business, and the School of Education are now housed under the College of Engineering, Business, and Education. It is being led by Dean Tarek Sobh. Since 2014, Dr. Im has served as Dean of the University of Bridgeport School of Arts and Sciences. His accomplishments include leading the development of a strategic plan for the school; supervising and facilitating development and delivery of arts & sciences curricula within major and minor programs; and guiding and assessing delivery, development, and revisions to the University’s undergraduate general education core curriculum. He is a member of the President’s Advisory Committee, the Provost’s Council, and other UB committees. A philosopher, Dr. Im previously served as the Director of the Asian Studies at Fairfield University, where he obtained a grant from ASIA Network and the Henry Luce Foundation to offer a post-doctoral teaching fellowship in Japan studies and founded a relationship with the Korea Economic Institute. He also served as Associate Dean of the College of Arts and Sciences. Dr. Im serves on the editorial board of the Journal of Chinese Philosophy and is the founding editor of Warp, Weft, and Way, an academic website for international collaboration and information about Chinese and comparative philosophy. He is a member of the Committee on Asian and Asian American Philosophers and Philosophies. Dr. Im earned a bachelor’s degree in philosophy from University of California, Berkeley, and master’s and PhD degrees in philosophy from the University of Michigan, Ann Arbor. A longtime expert in developing, accrediting, licensing, and leading nursing education programs and nursing education, Dr. Papp has served as Founding Dean of UB School of Nursing since 2015. Under her leadership, the School of Nursing attained licensure from the Connecticut Department of Higher Education for an RN to BSN completion program. It also secured approval from the Board of Examiners for Nursing and the Connecticut Department of Higher Education, December 2015, for program initiation fall 2016. Previously, Dr. Papp was Director at Bridgeport Hospital School of Nursing from 2011 to 2015. Previously, she served for over 25 years at Bridgeport Hospital in various leadership roles. She is a member of the Connecticut League for Nursing, the National League for Nurses, and a member of Sigma Theta Tau International Honor Society. As a member of the Connecticut Council of Deans and Directors. Dr. Papp holds a Bachelor of Science in Nursing from St. Anselm’s College, a Master of Science in Counseling from the University of Bridgeport, and a Doctor of Nursing Practice from the Case Western Reserve University Frances Payne Bolton School of Nursing. Dr. Sobh also serves as the University of Bridgeport Executive Vice President. As UB’s EVP, he is responsible for research, innovation, and economic development activities at UB. He is also the Founding Director of the Interdisciplinary Robotics, Intelligent Sensing, and Control (RISC) Laboratory and a Distinguished Professor of Engineering and Computer Science. Previously, he served as Senior Vice President, Dean of Engineering and various other administrative and academic positions. He joined UB as an Associate Professor of Computer Science and Computer Engineering in 1995 and was a Research Assistant Professor of Computer Science at the University of Utah from 1992 — 1995. Prior to that, he was a Research Fellow at the General Robotics and Active Sensory Perception (GRASP) Laboratory of the University of Pennsylvania from 1989 to 1991. A world-renowned roboticist, Dr. Sobh’s academic background and research interests are in the fields of computer science and engineering, control theory, robotics, automation, manufacturing, AI, computer vision and signal processing. Dr. Sobh has published over 250 refereed journal and conference papers, book chapters, in addition to 20 books. He has also been awarded over 50 research grants totaling more than $25 million. Dr. Sobh serves on the editorial boards of 15 journals, and has served as Chair, Technical Program Chair, and on the program committees of over 200 international conferences and workshops in the Robotics, Automation, Sensing, Computing, Systems, Control, Online Engineering and Engineering Education areas. Dr. Sobh has presented more than 150 keynote speeches, invited talks and lectures, colloquia and seminars at research meetings, University departments, research centers, and industries. He has also consulted for companies in the U.S. and internationally to support projects in robotics, automation, manufacturing, sensing, numerical analysis, and control and has worked for Phillips Laboratories and for companies in Egypt. Dr. Sobh is a Fellow of the African Academy of Sciences and a member of the Connecticut Academy of Science and Engineering. Dr. Sobh graduated with honors with a BSc in Computer Science and Automatic Control from Victoria College, Alexandria, Egypt. He earned a Master of Science and a PhD in Computer and Information Science from the University of Pennsylvania in 1989 and 1991, respectfully. Previous Post:How Much Mud Will Stick In Final Week? Dr. Trombley hit the ground running and took a necessary pragmatic approach to shoring up UB. A very big share of the blame goes to Bill Finch, as a City Alderman, a private citizen, as a State Senator and as the mayor of Bridgeport, Bill Finch has been a disgrace to the University of Bridgeport of to the City of Bridgeport with his badmouthing of the University of Bridgeport. Does anyone know the connection,if any between The University of Bridgeport and the Korean Unification Church. That still matters.